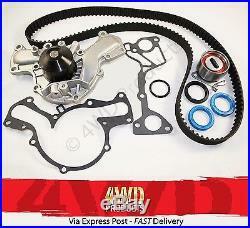 This'Water Pump/Timing Belt kit' inc. 1x pump assembly, 1x gasket/o'ring set, 1x timing belt 149teeth x25.4mm , 1x timing belt tensioner/bearing, 2x cam seals, 1x timing cover seal is brand new and fits. Pajero NF, NG, NH, NJ, NK 3.0 MPFI Petrol (LWB 5Dr Wagon 88-97 , w/6G72 V6 engine). Pajero NH, NJ, NK 3.0 MPFI Petrol (SWB 3Dr Wagon 91-97 , w/6G72 V6 engine). Triton MH, MJ 3.0 MPFI Petrol (2/4Dr Ute 90-96 , w/6G72 V6 engine). If you are unsure of your model, please feel free to consult with us. This kit includes high quality-standard (non genuine) replacement components. A licensed mechanic is to carry out replacement. NOTE to international buyers regarding available postal methods. Express Post International has basic tracking and provides details of: received by Australia Post/when item has been delivered. See the "4WD Products" store for a large range of 4WD parts and accessories. Variations maybe had in the colour of the seals supplied in this kit, however quality will not be compromised. The item "Water Pump/Timing Belt kit Pajero NF NG NH NJ NK Triton MH MJ 3.0-V6 6G72" is in sale since Tuesday, January 31, 2012. This item is in the category "Vehicle Parts & Accessories\Car, Truck Parts\Other". The seller is "4wd_products" and is located in Wentworthville, New South Wales.